- Fit: Great fit for my feet, wider in the forefoot than the Adizero XT Boost Trail and this works well for me since transitioning to wider forefoot shoes in general. The laser cut tongue was a little stiff on the first couple of wears, never causing too much of a problem and softened quickly. - What we did in it: Some good Lake District mountain running, mainly in dry conditions. - How they fared: Surprisingly well, At first I was very sceptical of the need for a BOA fastening system but it works very well, adjusts well and is quick and easy to get off if needed. 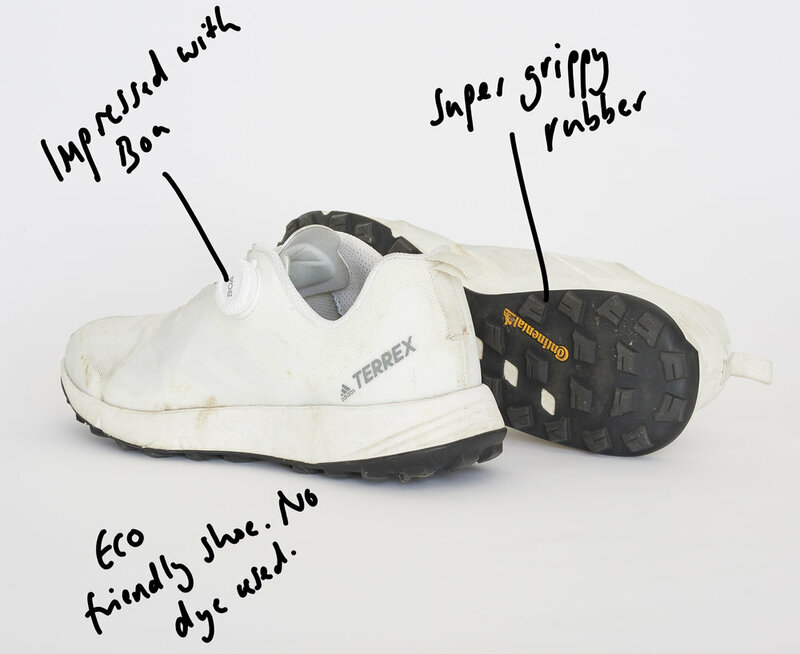 The real prize of these shoes is the Continental rubber sole unit which is super sticky giving exceptional grip along rocky ridges and great for some scrambling when required. Overall they were great, if you can get over the all white appearance and the gimmicky sales pitch that every mark tells a story then they are great shoes. Alternatively chose another colourway! Part of the German sportswear giant Adidas. Terrex is the brands entry into the outdoor performance market. Whilst the outdoor world can be skeptical of the big sportswear brands entering, Adidas has been incredibly supportive of the up and coming generation of climbers, trail runners and outdoor adventure athletes. There is a fine balance between the outdoor adventure sports desire for functional, fit for purpose garments and the big sports brands desire to constantly evolve technology. Using their skills of sponsorship, production and design, Adidas has the ability to be a great addition to the world of outdoor adventure sports if they ensure they uphold the standards expected by adventure athletes.